Merle is an interdisciplinary expressive arts and movement educator has always been interested in what liberates us and the journey of our lives. After living in Europe for a while, she travelled for twelve months around the world in a west/east direction, experiencing different cultures and traditions, During her travels, in Bali and Papua New Guinea she witnessed embodied expression in song and dance by hundreds of indigenous people. At the end of her travels she reflected on how she viewed herself in the world and her interest in the mind and body relationship. The human potential movement was a welcoming door for her. She later became a body and creative arts therapist and trained in Butoh dance. Now she could synthesize her work with embodied expression and her therapy trainings and wanted to contribute something to make a difference to people’s lives. She developed multi-disciplinary programs focusing on reversing self-imposed limitations which holds us back from being who we truly are while exploring the relationship between the mind, body and creative imagination. Using the fundamentals of creativity and movement based expressive arts practices. She offers an abundance of creative tools to her students to live from a deeper wisdom by tapping their inner resources. She teaches and presents her work internationally. 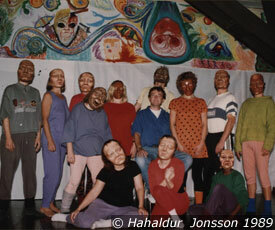 AIKE Centre – Arbeitskreis fur individuele ond kollektive emanzipation (Austria), Skyros Centre (Greece), Mandala Senter for Helhet (Norway), Black Mime Theatre (London), Instituto Wilhelm Reich (Mexico), Instituto Venezolano de Bioenergetica (Venezuela), Universitetet I Trodheim (Norway), Centrum for Psykosyntes and Kreativ Kommunikation( Sweden), Skandinaviska Institutet for Uttryckande Konst ( Sweden), Rogaland School of Art (Norway), Nordic Black Theatre (Norway), Ängsbacka Kursgård (Sweden). She also met many remarkable teachers and individuals, either in person or through the legacy of their work, who have had an influence on her learning and unfolding of her practice. Her sources are diverse. The writings of Wilhelm Reich and Alexander Lowen . Through her trainings with Augusto Boal. The leadership of Desmond Tutu in the Truth and Reconciliation Commission. It has been exciting to be in this process of opening my creative forces, be introduced to new expressive activities and to discover new possibilities. There has been many challenges, old patterns, habits and blocks have become much clearer. There has been changes.